Today, when it comes to providing the best in-room TV experience for your hotel guests there are only 3 options. With cable and Satellite TV providers offering a large variety of channels for residential customers, if you want happy hotel guests giving them just the local stations available on an over the air antenna is not a viable option. So in this article, we will discuss the difference between the guest (and hotel) experience of cable vs satellite TV. Aside from the technology platform used to deliver the television signal to the hotel property, there are many differences between cable and Satellite TV programming providers. For High Definition TV, the choice is 720P vs 1080P. Almost all TVs that your hotel guests are purchasing for use in their homes today are 1080P capable. A new high definition standard, 4K Ultra HD, has been released and is starting to see more general acceptance in the hospitality industry. 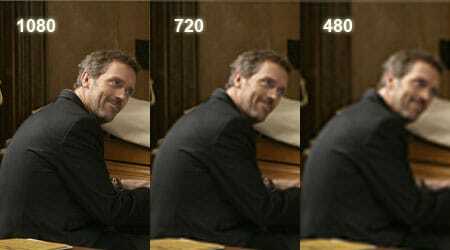 720p = 1,280 pixels displayed across the screen horizontally and 720 pixels down the screen vertically. This arrangement yields 720 horizontal lines on the screen. 1080p = 1,920 pixels displayed across the screen horizontally and 1,080 pixels down the screen vertically. This arrangement yields 1,080 horizontal lines on the screen. 720P broadcast is about 1 million pixels and 1080P is about 2 million pixels. The 1080P broadcast has the potential to show a lot more detail. It is a very noticeable difference on screens larger than 27″. Cable TV picture quality is limited by its technology to just 720P. Most of the high definition programming broadcast in the US today is in 1080I or Blu-Ray quality / 1080P. DIRECTV is the 1st multi-channel video provider to deliver 4K Ultra HD. In their homes, Cable and Satellite TV subscribers both have a tremendous amount of channels available to them. The best residential subscription TV programming packages have 285+ channels with 190+ in HD. So how about cable and satellite television packages available for Hotels? Cable TV packages available for the Hospitality industry from Comcast, Charter, Cox and Time Warner are very limited. According to their website as of 7/17/17, Comcast’s largest package for the Hotel industry has just 80 channels total including locals. According to a recent article in Broadcasting & Cable magazine Comcast is the industry leader for cable in terms of channel availability for Hotels. By comparison, lodging and institutions packages from satellite provider DIRECTV are available with 160+ channels with more than 75 in HD. Today your hotel televisions system is expected to do more than just show television programming. PMS integration to ease check out & billing, Guest Welcome Screens and Concierge services, Local Events and Services screens, ability to use personal devices like a PC, tablet or gaming device, are all expected services on today’s hotel TV. 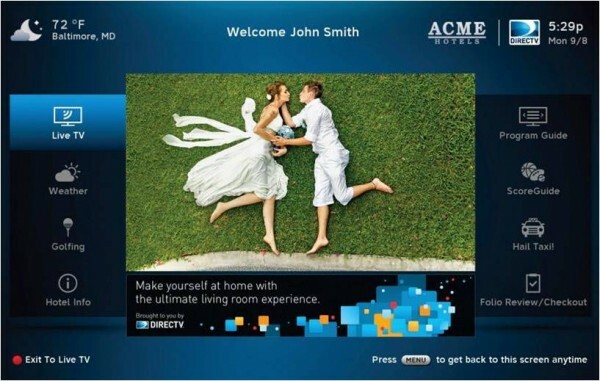 The DIRECTV Residential Experience’s (DRE) new Guest Welcome Screen system is revolutionary in what it can do for your hotel and with the release of Guest Welcome Screen Pro on 5/28/15, even more features, customization and functionality were made available for hotel customers. The question you have to ask is how well will the technology in the hotel television system you are considering integrate with your IT infrastructure and your property management software systems. Can legacy technology like cable integrate with your evolving IT systems? This may be the most important factor in limiting your capital expenditures. In just a few short years TV for Hotels went from analog Standard Definition broadcasts that you could display on any TV to digital High Definition broadcasts in 720P that required a mpeg-2 flat screen television and then later an mpeg-4 HD television to digital rights management systems and Pro:Idiom or Veramatrix encrypted broadcasts in 1080P that require sophisticated head end systems to deliver. The pace of the technological advances in Hotel TV and IT is growing ever faster and legacy providers like cable television have struggled to keep up with the changes. Cable’s platform limits their ability to provide the best possible viewing experience today and as technology advances they will fall even further behind. Satellite TV providers such as DIRECTV are constantly working to bring you the newest hotel television system technology like the COM2000 HD Headend and more recently the revolutionary DIRECTV Residential Experience for Hotels. DIRECTV has also brought the TV experience guests love at home right now into your hotel rooms. Only with DIRECTV can you offer your guests the same remote control, the same interactive channel guide and even the digital video recorder (a very popular feature for luxury, business traveler focused and extended stay properties) that allows them to watch the shows they like on their schedule. If you are in a situation that requires a set top box, the DIRECTV client box is just 8.66″ wide, 1.12″ high and 5.75″ deep. It can easily be hidden on a wall mount behind the TV or to the back of the credenza. And because it utilizes RF technology, you will not have to see the receiver at all to change the channels. All of these things help to make your hotel TV system easily adaptable for the constant changes in technology. Cable and Satellite TV providers have programming packages for hotels that are priced similarly. Cable and Satellite TV providers have packages that offer subsidies to offset the cost of equipment or lease packages to lower upfront costs. Whether you are looking for a basic package or a top of the line package, your costs will be similar. The difference is in the value you and your hotel guests receive. On cable the basic programming packages offer little more than your local channels. On Satellite TV provider DIRECTV, the basic programming package provides your local channels plus an additional 45 family oriented channels. On cable, mid-level packages offer your local channels plus premium channels like ESPN and HBO. On Satellite TV, mid-level programming packages provide 100+ channels including ESPN, ESPNews, ESPN2 and ESPNU + the availability of all 4 premium movie channels. On cable, top level packages offer 60-80 channels with up to 60 in HD depending on the market. On Satellite TV provider DIRECTV, top level packages include 160+ channels with 75+ in HD. Channels including The Movie Channel, 8 Encore channels, and the most comprehensive sports programming: CBS Sports, Golf Channel, MLB Network, NBA TV, NBC Sports Network, NFL Network, NHL Network, Fox Deportes, Univision Deportes, and more! The biggest difference is Asset vs Cost. With cable you get a wire coming into the wall that delivers a TV signal. Its simply a line item cost on your P&L statement. With DIRECTV you own the TV system in your hotel. Whether you go with a headend system such as the Technicolor COM2000 or the new DIRECTV Residential Experience, you own the system. If you sell your property, that DIRECTV Hotel TV system becomes an asset that you sell along with your hotel. Determining which TV for Hotels provider will give you the best TV experience for your hotel guests, the best hotel TV picture quality, the best programming packages, the best Hotel TV technology and the best value is easy. The next step is to find out which type of system and programming package will best fit your hotel’s needs, your budget and the needs of your hotel guests. DRE HD Access and local channels are separate monthly charges. Local channels eligibility based on service address. HD programming requires a DIRECTV® HD Receiver, HD television equipment and an HD Access fee of $0.75 per room per month. DIRECTV CINEMA HD movies starting at $5.99. Requires DIRECTV Residential Experience Plus system with Guest Welcome Screen. Dedicated Internet Connection and Property Management System integration required. 3mbp Internet bandwidth requirements only for off-hour refresh of movies. Actual number of titles will vary. DIRECTV CINEMA content requires an enhanced DRE HD Receiver (H25 or later) with DVR capability. Programming, pricing, terms and conditions subject to change at any time. Taxes not included. Movies expire 24-72 hours after you have begun to watch them. HD Access fee is required in order to receive any HD channel within any package. Not all networks available in all markets. NFL, the NFL Shield design and the NFL SUNDAY TICKET name and logo are registered trademarks of the NFL and its affiliates. HBO® and related channels and service marks are the property of Home Box Office, Inc. STAYCAST is a registered trademark of SONIFI Solutions, Inc. Google Chromecast is a trademark of Google Inc. ©2017 AT&T Intellectual Property. All rights reserved. AT&T, Globe logo, DIRECTV, DIRECTV CINEMA and all other DIRECTV marks contained herein are trademarks of AT&T Intellectual Property and/or AT&T affiliated companies. All other trademarks and service marks are the property of their respective owners.